International research shows that early intervention programs during pregnancy and in the early months and years of a child's life have great positive impact on later health. However, for some Indigenous Australians, early intervention support for mother and baby is not always possible, and the child can be subject to poorer health and cognitive development than non-Indigenous infants. Professor Kerry Arabena, Chair of Indigenous Health from the University of Melbourne's School of Population and Global Health, and Director of Onemda VicHealth Koori Health Service (a group committed to community-driven research and partnerships to improve Indigenous health outcomes), is co-ordinating a comprehensive approach for Indigenous infants and their parents. 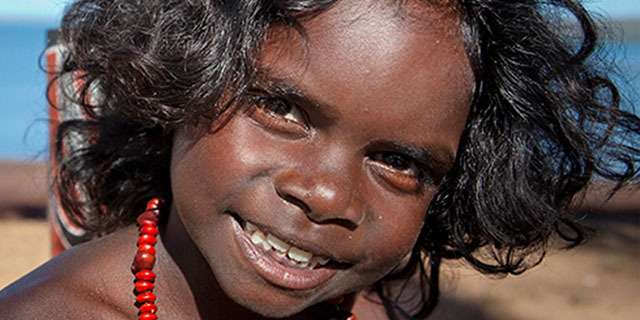 Professor Arabena has called on healthcare workers, community organisations and all levels of government from over 30 institutions to address the growing gap in infant and parental health in Indigenous communities. In a recent national symposium hosted by the Indigenous Health Equity Unit at the University of Melbourne, researchers focused on designing studies that will produce a measurable index on the impact of First Thousand Days intervention programs and to consult on the establishment of a Scientific Committee to progress the University's research agenda in this age group. The First Thousand Days is a global movement addressing child development in the first 1000 days of life from conception to age two. "This is the inception point for the next step in collaborating towards equity," Professor Arabena says. "We are here to design key elements of scientific committees to drive further discussion and strategy." Key areas of concern include the increasing number of children being placed in out-of-home care; the high instance of incarceration rates and high propensity of being victims or perpetrators of violence and abuse across the community. "The statistics for out-of-home care is dire with a 42 per cent increase of Koori children removed from their immediate family; or 63 in 1000 in a two-year timeframe according to the 2015 Commonwealth Report on Government Services," Professor Arabena says. "The disenfranchisement of Indigenous children from their families and communities can limit their capacity to develop neurologically and impact on their early years at school, meaning they are forever playing catch-up in a world not willing to wait for them, leading ultimately to a self-perpetuating cycle of intergenerational disadvantage." Dr John Boffa, from the Central Australian Aboriginal Congress, described the trial of a seven-week program designed to increase attendance and engagement at school using the Abecedarian Approach of learning games, conversational reading and enriched care-giving. "Attention at this preschool age of three to four years old is critical as 90 per cent of the brain is developed by age four and it is often not possible to repair certain behavioural traits when they appear in adolescence," Dr Boffa says. "There are many programs around Australia that show how individualised care and support for Indigenous infants and their families can produce results and have valuable lessons for wider populations." The Apunipima Cape York Health Council's Baby Basket Program was established to ensure expectant mothers from remote Queensland were equipped with basic needs when travelling to Cairns for check-ups. The program gives baskets to new mothers to provide essential products and educational information at various stages of pregnancy and the infant's life. "Evidence shows this program empowers parents and encourages more frequent contact with health care workers," Dr Boffa says. The program improved the iron levels of expectant mothers and the rate of return visits at crucial stages of their babies' development, and fostered relationships between healthcare workers, parents and babies. Professor Arabena says what became apparent from all contributors at the symposium is that early stage access to help and information is absolutely crucial to making a significant impact on future health. "Addressing key social problems facing a disproportionate number of Indigenous adults such as violence, high incarceration rates, and drug and alcohol use, are crucial first steps to reducing the instance of out-of-home care and providing safe nurturing environments for children." Good nutrition for parents and baby, family and community care and support, and raising the visibility and role of fathers, all contribute to healthy and happy children. "What parents and children need for happy and healthy development is not necessarily new, however the failure of the current disjointed support system means that the information, resources and care do not always reach those who need it most," Professor Arabeena says. "Indigenous leadership programs, such as those being implemented by the Poche Centres for Indigenous Health across Australia are another initiative designed to drive systemic change from within Indigenous communities. The symposium was the first part of a longer conversation aimed at developing a clear evidence-based strategy to support vulnerable parents and their children for all Australians.